Apple released three video ads, each ad centering on using a service, and paying for the transaction using the iPhone X with Apple Pay and Face ID. 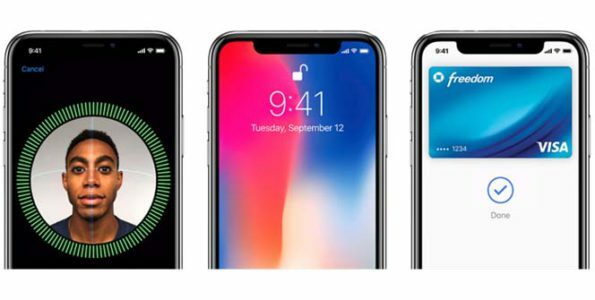 The three less than thirteen seconds ads focus on the convenience of having Apple Pay and Face ID on the iPhone. The first thirteen second video ad titled “Grooming ” begins with a woman entering into a room, only to find dirty paw prints all over an area rug. With a quick glance at the iPhone X, she orders pet cleaning equipment using Apple Pay and Face I D.
The quick twelve second video ad once again focuses on using Apple Pay with Face ID while grocery shopping for items needed to prepare an eccentric water animals fruit salad. The last quick eleven second video ad takes place in a coffee shop, a man orders his coffee, and with a glance at his iPhone X, his coffee is paid for. Click on each ad to watch how easy and fast it is to buy items using the iPhone X via the Apple Pay, and Face ID.